Heat a 10-inch skillet over medium heat, add the oil and heat until oil is smoking. Add the onions, garlic, jalapeños, cumin and paprika and cook until softened, 3-4 minutes. Add the honey, TABASCO® Sauce and tomato juice and bring to a boil, cooking for about 4 minutes before removing from heat. Transfer the mixture to a blender and pulse until smooth. Allow the purée to cool to room temperature and then place mixture in refrigerator until chilled. Place the skirt steaks into a sealable plastic zipper bag and add half of the purée, making sure to coat the steaks fully. Store chilled for at least 12 hours and up to 72 hours. Place the remaining purée in a sealable bowl, season with a tablespoon of salt and refrigerate. When you’re ready to grill the steaks, season them with salt and pepper and allow them to rest at room temperature for 20 minutes. Grill over extremely high heat, about 5-6 minutes, on the first side, then turn and cook 4-5 minutes on the second side, until they are nicely charred on both sides. Move steaks to a cutting board to rest at least 10 minutes. Meanwhile, in a medium bowl mix together the chopped red onion, cilantro, spring onions, lime juice, lime zest, and remaining 1 tablespoon TABASCO® Sauce. Heat the tortillas on the grill and place in a folded towel to keep warm. Cut the steaks across the grain into 1/2-inch slices. Place 2 or 3 slices of the steak in a warmed tortilla and add a heaping tablespoon of the red onion-spring onion salsa. 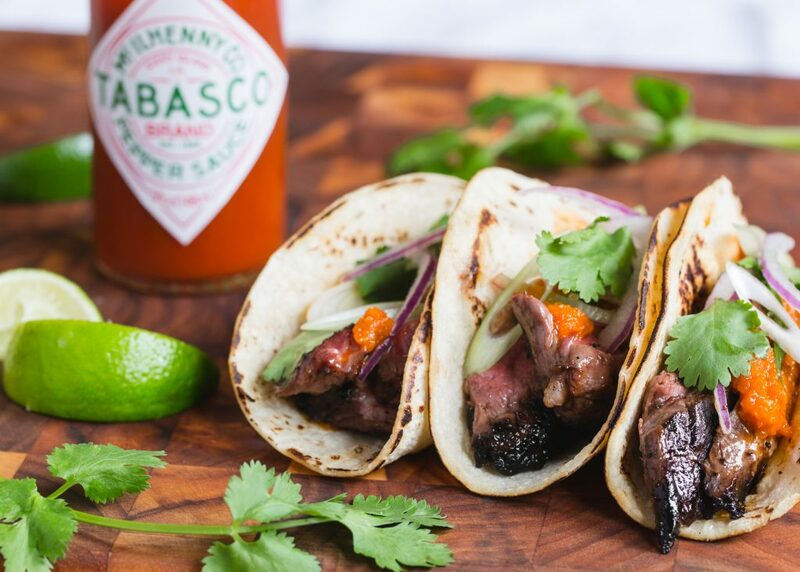 Finish with a teaspoon of the original purée, a squeeze of lime, and more TABASCO® Sauce. Serve the tacos with your favorite toppings on the side, like shredded cheese, sliced jalapeños, cilantro, etc.